Human colon tissue biofilm status is associated with distinct microbiota genera in GF ApcMinΔ850/+;Il10–/– and ApcMinΔ850/+ mouse models after gavage. 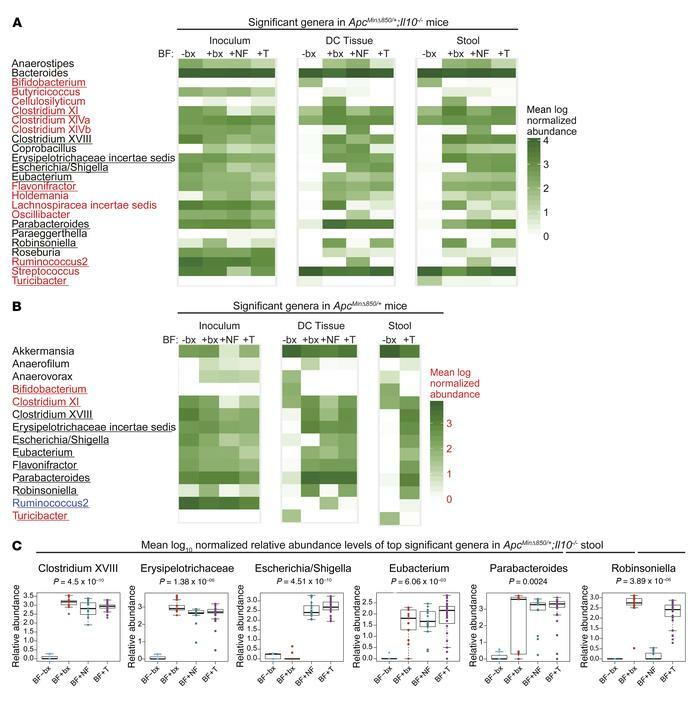 (A and B) Heatmaps depicting mean log10 normalized relative abundances of all genera that were significantly different according to biofilm status in either the stool (red font), distal colon tissue (blue font), or both compartments (black font) of ApcMinΔ850/+;Il10–/– mice (A) and ApcMinΔ850/+ mice (B). The 11 genera common to both genotypes are underlined. Corresponding log10 normalized relative abundances of each inoculum are shown for comparison. (C) Box plots of the mean log10 normalized relative abundances of individual genera in ApcMinΔ850/+;Il10–/– stool that were significantly different in both the stool and distal colon compartments in both genotypes. All P values are Benjamini-Hochberg adjusted.